MARSHFIELD – The Marshfield boys basketball team began the second half of its Wisconsin Valley Conference schedule on Friday night against first-place Merrill and couldn’t afford another loss to the Bluejays if it wanted to keep its championship hopes alive. With its outside shooting sporadic, the Tigers clamped down on defense in the second half and used a superb performance at the free throw line to slide past Merrill 62-52 at the Marshfield High School Fieldhouse. Marshfield pulls to within a game of the conference lead with the victory, improving to 9-4 overall and 5-2 in the WVC after posting its sixth game in a row. Merrill falls into second place at 6-2 (13-3 overall). With its victory over Wisconsin Rapids on Friday night, Stevens Point regains the conference lead at 6-1. The lead changed hands six times in the first half before Merrill pulled ahead with a 10-3 run keyed by 3-pointers from Chase Bonnell and Michael Casper to take a 20-15 lead. The Bluejays held the lead for the rest of the half. A basket by Marshfield’s Tommy Olson just before the buzzer made it 28-26 at halftime. Marshfield was just 4 of 13 from 3-point range in the first half, seemingly settling for the outside shot as Merrill played stellar man-to-man defense around the basket. The Tigers figured out a way to get to the hoop in the second half, and it resulted in a barrage of fouls by Merrill. The Bluejays scored the first six points of the second half to go up by eight before Marshfield stabilized the game. A pair of 3-pointers by Brant Bohman and a basket by Anthony Posteluk brought the Tigers to within three at 38-35. Bonnell scored at the 12:52 mark for Merrill and Quinn Steckbauer added a free throw 30 seconds later to put Merrill up 41-35, but from that point on it was all Marshfield. The Tigers scored the next 10 points to take the lead for good. A three-point play by Addison Hill started the run and Marshfield was able to slowly put the game away at the free throw line. Marshfield made 20 of 26 free throws in the second half. Preston Wagner went 9-for-9 and Posteluk was 4-for-4 in the second half to help the Tigers pull away. Marshfield led by at lead four the rest of the way and held Merrill to just one made basket from the field in the final 12½ minutes as the Bluejays were 1-for-11 shooting. Posteluk finished 4-for-4 from the field and 6-for-6 at the free throw line to score 16 points to lead the Tigers. Bohman added 13 points. Michael Casper was 10 of 12 at the free throw line and scored 21 points for Merrill. Marshfield will have a busy week next week. 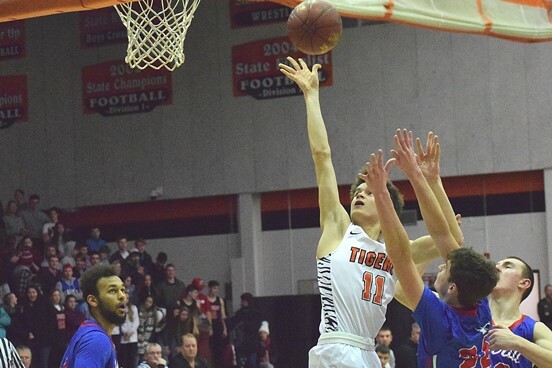 The Tigers host Wisconsin Rapids on Monday, a make-up game from this past week that was postponed due to bad weather, then will travel to D.C. Everest for its final conference road game of the season. Marshfield will host Wausau East on Feb. 1. Seven of the Tigers’ final nine games will be at home. MERRILL (52): Dan Pepke 0-0 0-0 0, Jake Zelinski 0-0 0-0 0, Quinn Steckbauer 4-9 6-9 15, Isaac Sutton 0-0 1-2 1, Jacob Leopold 0-0 0-0 0, Michael Casper 4-7 10-12 21, Connor Mootz 0-3 0-0 0, Piersen Pyan 0-4 0-0 0, Chase Bonnell 3-6 0-0 7, Caleb Timm 2-2 0-0 4, Kordell Renken 2-6 0-0 4, Bryce Dresen 0-0 0-0 0. FG: 15-37. FT: 17-23. 3-pointers: 5-15 (Casper 3-5, Steckbauer 1-2, Bonnell 1-1, Mootz 0-2, Renken 0-2, Pyan 0-3). Rebounds: 20 (Bonnell 6). Turnovers: 15. Fouls: 25. Fouled out: Renken, Mootz. Record: 13-3, 6-2 Wisconsin Valley Conference. MARSHFIELD (62): Issac Meverden 2-6 5-8 9, Brant Bohman 5-11 0-1 13, Tommy Olson 2-7 0-0 4, Cody Korth 0-0 0-0 0, Anthony Posteluk 4-4 6-6 16, Preston Wagner 0-3 9-9 9, Sam Hinson 0-0 0-0 0, Kyle Tremelling 0-0 0-0 0, Joey Goettl 2-2 0-0 5, Addison Hill 1-1 4-6 6, Will Nikolai 0-0 0-0 0, Bennett Koehn 0-0 0-0 0. FG: 16-34. FT: 24-30. 3-pointers: 6-19 (Bohman 3-8, Posteluk 2-2, Goettl 1-1, Meverden 0-2, Wagner 0-2, Olson 0-4). Rebounds: 27 (Posteluk, 6, Wagner 6). Turnovers: 16. Fouls: 19. Fouled out: none. Record: 9-4, 5-2 Wisconsin Valley Conference. Next articleQ&A: How soon will the federal government get back in order?